I hope you enjoy it. I thought I'd start things of by answering the questions myself to give you more of an insight to our shopping and meal planning process. 1. Do you have a weekly budget for groceries? I don't really have a budget. Sometimes as little as £45 other weeks as much as £100, there are 3 of us during the week and every other weekend we have the teens who now eat adult portions. I need to get more consistent so I can have a better budget. 2. What your meal plan this week? I shop around really, I do a 'freezer' shop at Iceland every few weeks, usually Aldi & Tesco for the weekly shop and top up fresh salad, milk etc at sainsburys during the week. I get snacks and storecupboard bits at the pound shop and B&M. A few months ago I was really good, I'd check out all the coupons, use the shopping apps to get money off, shop my cupboard's first and base my meal plan around what was on offer, but that does take time and I'm afraid I've let that slip. So my biggest tip is to make time to do the ground work and print off vouchers, search for bargains and the obvious one, don't go shopping without a shopping list. This is my veggie family meals board. This is my family meals board. Fresh fruit and veg, I buy too much in one go and then some gets wasted. I'm vegetarian but try to eat 2 vegan meals a day and my husband and son both eat meat, the teens also eat meat. My husband eats very few vegetables so that can be a bit of a challenge, although all 3 kids eat pretty much everything except mushrooms. I used to coupon and now I really only use the tescos ones through the post. I would love to get back into it, I just need to make the time as it is time consuming. I quite like the facebook groups for coupons but I also use shopitize and checkout smart apps. I'm in a massive rut at the moment and keep making the same old meals. The Hubs and I want to try and be healthier, but with us both having diets at the opposite ends of the spectrum it takes a lot of effort and I struggle to make that a priority. 10. What's your go to storecupboard pudding. Bananas and packet custard with sprinkles! We used to have quite a stockpile, but now with the pound shops and offers always on I don't tend to bother quite so much. I do always have at least 1 of every cleaning product. A tip? Watch out for price per unit, particularly in the pound shops, sometimes it's cheaper to get a 2 for 1 offer in the supermarket, as the sizes are generally a little bigger. 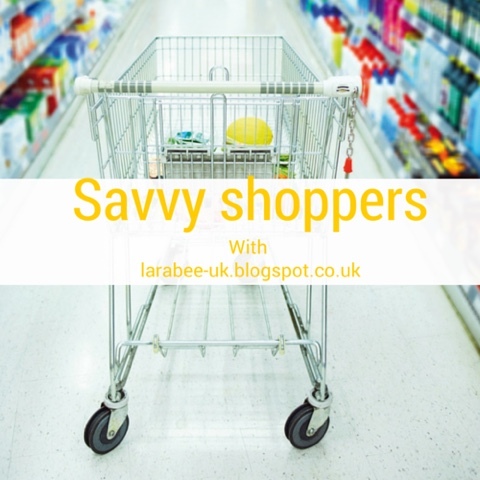 Don't overlook supermarket home brands. 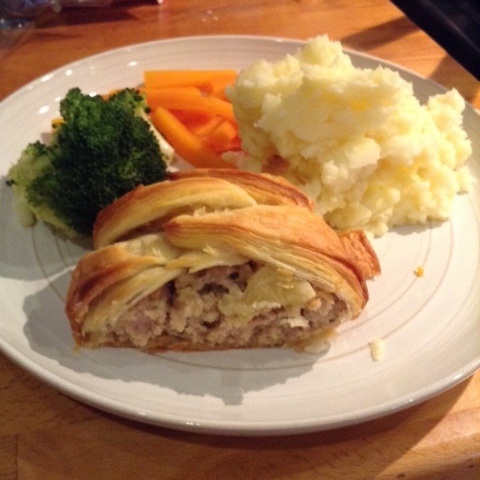 This sausage plait is a current favourite at the moment, they can't get enough of it's super cheap and can be made out of the freezer. 13. Do you do any meal prep to save time/money during the week. Yes, I grate cheese and store in a food saver jar. Once a month I also dice a load of onions and peel lots of garlic for the freezer, both save so much time when cooking during the week. A cup is about the size of a large onion. 14. Does you family have any dietary considerations? I don't really anymore, I'd love to but we only have a tiny freezer, it's something I'd love to do more of again when I've cleaned out the freezer or have a new chest freezer. I find it a godsend. 16. Finally, what's your favourite time saving kitchen gadget? I need 2! Definitely the slow cooker, I love them. I really love being able to throw everything in and forget about it until dinner time. And the food saver, mine is ancient now but still works as good as new, fab for food storage.